BUFFALO, N.Y. -- University at Buffalo women's soccer forward Carissima Cutrona was named Female Scholar Athlete of the Week by the Mid-American Conference for her performance this past weekend, as announced by the conference office on Wednesday. This marks the first time in her UB career that Cutrona has received the weekly honor. 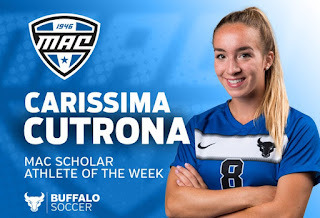 Cutrona, a social sciences major with a 3.910 GPA, had another strong weekend for the Bulls as she helped lead UB to a perfect 2-0 record as they collected wins over Central Michigan and Eastern Michigan at home. Cutrona finished off her weekend with two goals, an assist and eight shots as she proved to be the best player on the field at all times. On Friday, Cutrona came out flying early for the Bulls as she netted a goal just 19 seconds into the match after a great individual effort. She took a Marcy Barberic feed, darted to the right and beat the keeper back to the left post for the eventual game-winner. Later in the match, Cutrona notched her eighth assist of the season on Adrianna VanCuyck's goal in the 82nd minute to cement the Bulls 2-0 victory. On Sunday, Cutrona was all over the field for the Bulls as she was able to tie the match, 1-1, in the 49th minute as she beat the Eastern Michigan keeper to the left corner of the goal. She finished off Sunday's match with a game-high five shots, four on goal in the 2-1 overtime victory. For the season, Cutrona is the only player in the NCAA with at least eight goals and eight assists as she leads the MAC with 24 points through 11 matches. The senior has set a career-high with eight assists while also compiling 32 shots and three game-winning goals on the year. For her career, Cutrona moved into sixth place on the Bulls all-time scoring charts this weekend as she has 28 career goals for the Bulls. Her 18 career assists rank fifth in school history and her 74 career points ranks her sixth all-time, most career points for a Buffalo player since Paula Listrani finished her career with 116 points in 2000. Buffalo will return to the pitch tomorrow night as they travel to Kent State to take on the Golden Flashes at 7:00 pm. The Bulls will then return home on Sunday afternoon as they welcome the Ohio Bobcats to UB Stadium.